Honey, Will I Ever See You Again? Don, W9EBK, has a great story to share of his and XYL Claudia N9HHE's travels to the Dayton HamVention and the ARDF Meet in Cincinnati...let's let him tell it. "I often hear that you never know who you will meet through ham radio. This year has been serious proof of that. It started with our trip to the Dayton Hamvention in May. At lunch on Saturday Claudia, N9HHE and I found seating under a pavilion near the food area. As is usual at Dayton seating in the food area is crowded. If you find a seat, take it! We don’t look at this as a bad thing since sharing of tables leads to conversations with people you might not otherwise speak with. I had a sign pinned to my shirt advertising an amplifier I had for sale. I don’t see this method of advertising used much at other hamfests, but at Dayton it’s fairly common. As we ate lunch a ham of Asian heritage struck up a conversation with us and asked if he could take our photo. He was fascinated with my method of advertising the amplifier. We thought little more of it. See Event 5 for the result! As you may have heard the Dayton Hamvention moved to a new location this year. Like many first-time events there were some problems with traffic and parking, especially the first day. Although mostly sorted out and fixed after that first day many Uber, Lyft, and taxi drivers were reluctant to come to the Hamvention venue out of fear of long traffic delays. As we were leaving the Hamvention for the final time on Sunday afternoon we came across Eric 4Z1UG visiting from Israel asking if anyone was going to a certain hotel. The hotel was not where we stayed but our route would take us right past it. We chatted a few minutes, loaded our stuff into the car, and had a nice visit with a foreign ham as we gave him a lift back to his hotel. Claudia and I missed seeing many local hams at the Carlinville hamfest on Saturday August 5. We were in Cincinnati, Ohio that week for the International Amateur Radio Union Region 2 (all of North America and South America), and U. S. National ARDF (Amateur Radio Direction Finding) Championships. ARDF is an Orienteering and radio direction finding competition where people on foot race through the woods searching for transmitters while testing their orienteering, map reading, and compass skills. Unlike the more common American style direction finding which is conducted by driving around in cars, ARDF is an athletic event that is a very popular in Eastern and Northern Europe, Russia, former USSR nations, and most of Asia. In addition to U.S. and Canadian hams and ARDF enthusiasts (remember you don’t need to have a license to receive), a school from Guangzhou province in China joined us. The school had attended the 2015 ARDF Championships in Colorado Springs. This year they came back with about 40 middle and high school students and 10 teachers. A number of top ARDF competitors from Ukraine, Germany, and Australia rounded out the field. While at the event we volunteered to shuttle some of the Chinese students to and from the hotel and the forests where the ARDF events were held. We got to know several of them well. All the students speak some English. Most, but not all, of the teachers spoke some English. 3 members of the Chinese team were very fluent in English because they have lived in the U.S. for several years for work or college. After spending 4 days with them hunting transmitters in the forest, traveling, dining, and helping them practice English we are very happy to have met them. We have exchanged emails so we can stay in touch. This seems routine to us, but with Chinese restrictions on services like Yahoo and Google, it’s not as easy as it sounds. For the 15 years I have been into ARDF I have been using a Yaesu VR-500 receiver with a home-brewed antenna system. It worked, but not as well as I would have liked. Earlier this year Ham Radio Outlet announced they would begin carrying the FoxRex 3500 ARDF receiver. This is a world class receiver for 80 meter transmitter hunting. Buying one was big step forward for me. The receiver is a Rig Expert product from Ukraine. It’s a menu driven receiver with a lot of features. No problem figuring it out as Oleg Shuman, UT5UML the Ukrainian ham who designed it was at the Cincinnati ARDF meet. He was very happy to see several of us using his new receivers. He was very forthcoming with advice and instructions on using our receivers. He left the event with some ideas about improvements. Oleg and I have emailed about issues and methods of using the radios. It’s nice to have a relationship with the person who designs the equipment you use. When Claudia and I returned home from Cincinnati we went through our backlog of mail. 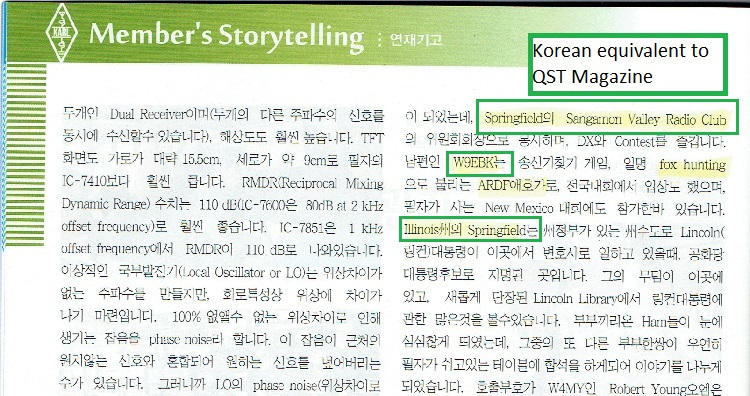 In it we found an envelope from Sang M. Lee, K7MOK containing a copy of the Korean Amateur Radio League magazine, the Korean equivalent of QST. In it was an article by Sang about the Dayton Hamvention. 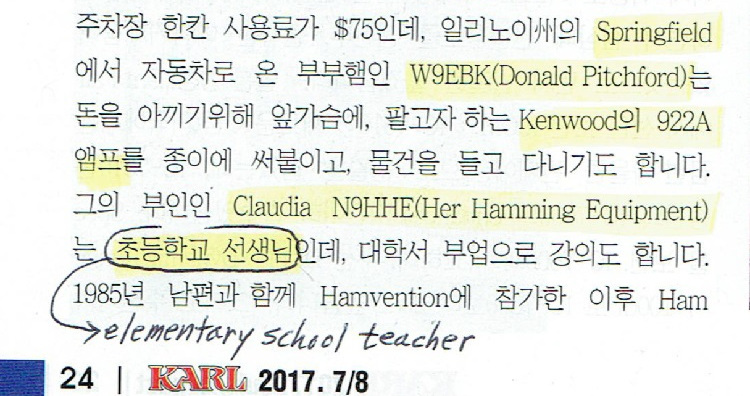 Written almost entirely in Korean we didn’t understand most of the article but it shows a photo of Claudia and me, mentions she is a school teacher, and also states we are members of the Sangamon Valley Radio Club. In the 4 months this summer I can say that ham radio has directly led me to meeting at least a dozen people from 4 foreign countries, as well as numerous stateside hams we would otherwise never have met. 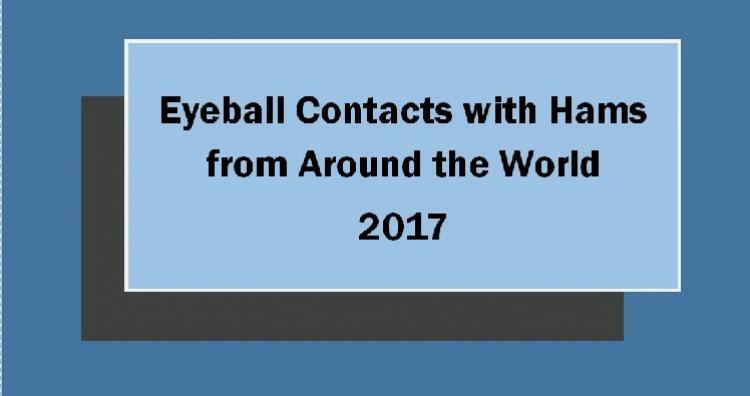 DXing and many digital modes often lead to “hello/goodbye” preprogrammed contacts. It’s nice to break out of that mold and actually meet and talk with people, no matter how much you need to use Google translate, or rephrase your statements to be able to understand one another." Support SVRC by joining today.